Is your website and your web marketing working to the max? If not then why not? What should you change? This is where web analytics comes in. We'll use our analytics tools to disect the overall performance. We'll develop an improvement plan and work with you to implement it as fast as is possible. 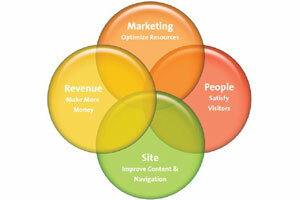 Web analytics starts with the gathering of data about the interaction of visitors with your website. Through the analysis of data we can establish what people view on your site, their route through your site, what they did of value at your site, and even how they exited. In fact the use of web analytics is about providing transparency about what happens at your website, working out why, and then making it even more effective. It can also provide rich insights into your website's usability as well as disclosing which sources of website traffic are the most profitable. So web analytics ties into your online marketing activity too. We'd always recommend having web analytics installed on your site. The cost to set it up and manage it is very modest compared to the value it generates. Think of it as your website's dashboard. The information it gives allows you to control your website and its marketing so much more accurately. It also allows you to test changes and measure performance. The setting up of analytics on your website is relatively straightforward. Once installed the data is gathered automatically. The value comes from analysing the data and looking at trends over time. There are various options as to how we can work with you using the web analytics data. As mentioned the availability of this data is often a prerequisite for online marketing planning and buying, and website reengineering for better usability and roi improvement. Contact us to discuss how we can help you with web analytics. Improve your website's effectiveness by designing-out weaknesses.